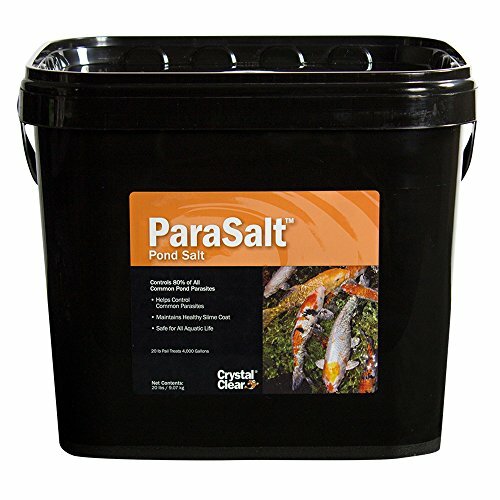 CrystalClear ParaSalt, pond salt is formulated to increase koi and goldfish electrolytic intake. Electrolytes are critical in building and maintaining a healthy slime coat. Electrolytes such as potassium are essential in wound repair and in times of heavy stress. ParaSalt is excellent for mucous production when healing from a wound. ParaSalt will also help ward off and remove most common protozoan parasites found in koi and goldfish. ParaSalt can be used in a salt bath for heavy infestations or as a routine treatment to keep parasites from entering the pond environment. 20lb bucket treats up to 4,000 gallons.